There is hardly a culture that does not include meatballs on its menu. A meatball is exactly what the name implies, a ball of meat. Of course, the unsaid part is that the meat is ground or chopped so it can be formed into the ball. The meatball can include various things for spice and cohesion. Salt, pepper and some flour or cracker crumbs go into the minimalist meatball. In my family, the plain meatball as described above was a fairly regular item on our table. The meatballs were fried and served with potatoes and some gravy -- usually brown gravy. My favorite was the Porcupine Meatball. The tasty spheres featured uncooked white rice in the meat mix. They were cooked in a lidded pot, along with cabbage and a can of tomato soup. Stuffed cabbage was a meatball wrapped in a cabbage leaf and braised to doneness. These meatballs were the same as the Porcupine variety, except a whole cabbage leaf was used and there was no tomato soup. Form the pieces into balls, rolling them in the palm of your hand. This works best as it compresses the meat and removes any air pockets. Now choose your cooking method. Frying is the traditional way to cook meatballs here in Texas. You just put them in about a quarter-inch of hot shortening and turn frequently until they are brown on all sides. To test for doneness, take one out and cut it in half. When they are done drain well on paper towels. You can bake the meatballs in the oven and avoid a little fat. Cover a jellyroll pan with foil. Give the foil a light spray of non-stickum. Bake the meatballs in a 350°F oven, turning once or twice, until you get the doneness you desire. You might want to try meatball kabobs. Use the two-ounce meatballs. Put a little thickening and about a tablespoon of barbecue seasoning in them when you mix. Thread them on skewers alternating with pieces of bell pepper and onion or whatever else you want. Or if you don't want to skew them, get one of the small-opening grates that fit on top the grill. Just turn the meatballs and baste once in a while. You have probably caught on by now that meatballs and meatloaf are the same except for size and cooking techniques. Any meatloaf recipe can be converted into meatballs as long as the product will hold together. All can be made to hold together by addition of: cornstarch, flour, cracker crumbs, an egg or a combination of the above. If you are using meat that has a higher-than-it-should-be fat content, use cracker crumbs in the mix. The crumbs will soak up the grease so the meatballs are less greasy. How do you check meatballs for taste before you cook them? Very simple. Take a sample of your meat mixture and make a ball about an inch and a quarter in diameter. Flatten it to one-quarter inch and cook it in a non-stick pan until it is done. You can get a very accurate prediction of how the finished product will turn out this way. This also works when you are making sausage. Mix the meat, rice, onion and seasoning in a large bowl. Form into about a dozen balls by rolling a portion in the palms of your hands. Set aside. In a suitable pot with tight-fitting lid, mix the soup with one-half can of water. Put in a double layer of cabbage leaves. Place the meatballs on top of the cabbage. Cover the meatballs with a single layer of cabbage leaves. Bring to a simmer, cover, and let simmer for about an hour, checking to make sure it's not boiling dry. If it needs more liquid, add boiling water. When the rice inside the meatballs is done, mix everything with a long wooden spoon and put the cover back on. Put on "warm" until serving time. This dish screams for mashed potatoes as a side. I find a little ketchup defines the flavor of the cabbage and tomato soup. Don't mix it in while cooking; use it at the table. You'll need one recipe for plain meatballs. Add 1/2 teaspoon dried oregano while mixing. Brown the meatballs in a little olive oil in heavy skillet. 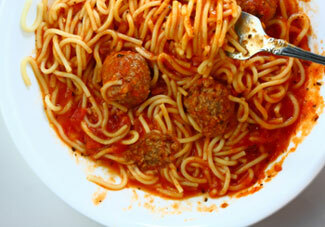 Add two cups of your favorite red Italian sauce and simmer until the meatballs are well done. Serve over your favorite pasta. Spaghetti is traditional. Start with one recipe for plain meatballs with about a tablespoon of barbecue seasoning included. Form the meat into one-inch balls, or just a little larger. Put the meatballs on skewers between pieces of onion and bell pepper. Grill over medium-hot coals until done.